Mystique, the iconic 20-story tower underway just steps from the beach in Pelican Bay, is not only making an impression on the Naples landscape, it is also making a profound economic impression – locally, regionally and nationally. 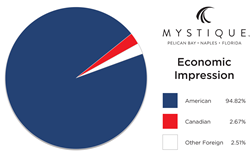 “It is extremely gratifying to know that Mystique’s overall economic impact is approximately 95% made in the USA,” said Gulf Bay Group of Companies President Aubrey J. Ferrao. Pelican 1 Owner, LLC, the developer for Mystique, is an equal partnership between an affiliate of the global investment firm Kohlberg Kravis Roberts & Co. L.P. (KKR) and an affiliate of the Gulf Bay® Group of Companies (Gulf Bay). Mystique is being constructed on one of only two remaining permitted and developable land parcels in Naples between The Ritz-Carlton on the beach and Port Royal. Mystique offers 68 estate and four penthouse residences with expansive living spaces and terrace views toward the Gulf of Mexico from most units. Additionally, Mystique offers nine Jardin residences. Construction at the ultra-luxury high-rise continues to progress. Recent milestones include the pouring of the 16th floor and supporting structural elements. The pouring of the 17th, 18th and 19th floors of the ultra-luxury high rise is expected to be completed by the end of April. Mystique’s Certificate of Occupancy is estimated to be achieved in March 2019.